Kaiser was born and raised in Bethel, and he’s been a consistent top performer in the Iditarod. He finished the race the past nine years, placing at least 14th every time except his rookie run. His best finish is fifth and he’s done that three times, including last year. 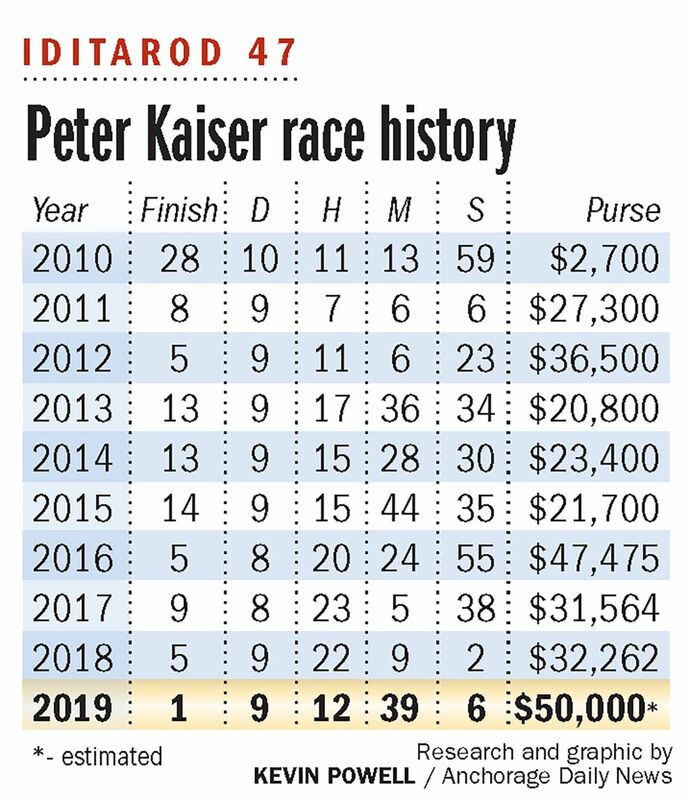 Kaiser is also a four-time champion of the Kuskokwim 300, a race that starts and ends in his hometown. He and his wife, Bethany, have two children: 6-year-old Ari and 1-year-old Aylee. On Tuesday morning, the three of them were in Nome as family, friends and other supporters poured in. Ari is very excited about the Iditarod, Bethany said. On the way from Bethel to here, he told people, “My dad’s winning the race,” she said. Bethany said she’s excited, too, but also knows that anything can happen between White Mountain and Nome. Kaiser started mushing for fun as a kid in Bethel with his family’s pet dog named Giant, said his dad, Ron Kaiser. “I’d put him on the runners and follow along with a snowmachine and make sure he didn’t get hurt,” Ron said. Ron is originally from Kansas. Kaiser’s mom, Janet, is from Bethel. Ron ran sled dogs in Bethel but got out of the sport when Kaiser was born, he said. Too much time. Too much money. But as Kaiser and his younger sister, Tillie, grew up, the family started to acquire more dogs again. “As soon as he’s getting big enough to need two dogs, we got another dog and then we got one or two more and then it just kept going,” Ron said. Kaiser and his sister competed in local Sunday races. As a high school senior in 2005, Kaiser won the 65-mile Akiak Dash. Kaiser tried college, Ron said, but decided what he really wanted to do was train and race sled dogs full-time. Kaiser started building his own team in Bethel. He currently has about 45 dogs in the Southwest Alaska community. As a musher, he’s humble, determined and motivated, wife Bethany said. He spends a lot of time in the evenings jotting down notes about his dogs and races. “I can’t even tell you how many notebooks he’s gone though,” she said. “He’s just listing dog names, times. He watches old Iditarod videos." “We believe he is the most knowledgeable racer we have ever encountered. He studied everything: past races, dog pedigrees, nutrition, equipment, you name it,” Angstman said. Bethany said Kaiser has a big support network in Bethel. He also has deep family roots there. His Yup’ik great-grandmother was raised in an orphanage in Bethel, said Kaiser’s mom, Janet. His Scottish great-grandfather came to the country as a gold miner, eventually landing in Bethel. Kaiser winning the Iditarod would be huge for Bethel and also the region, Janet said. It’s a close, dog-mushing community. Angstman said Bethel is brimming with excitement and pride, and people were desperate to find ways to get to Nome to see the end of the race.